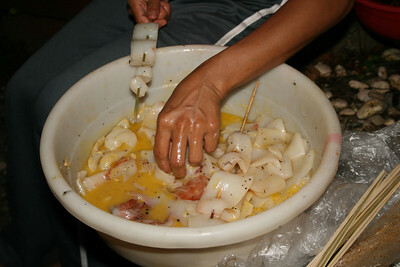 One wonderful thing for squid lovers if they ever go to Marinduque is that calamari here is abundant. And they're big and fresh. 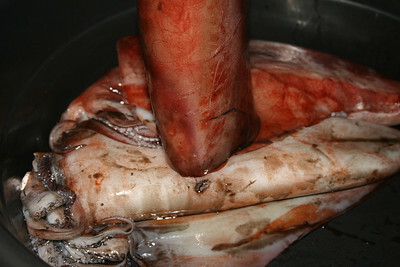 Sometimes, just one squid can weigh 7 kilos on its own. The catch though is that you may have to pre-order some if you're cooking them yourself because these are usually exported out of Marinduque to the big markets, restaurants and hotels in Manila. 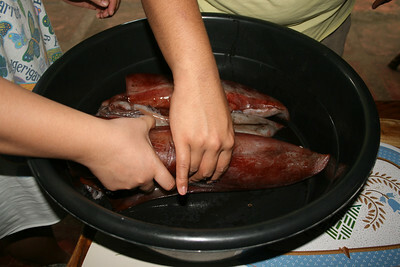 When we bought some this May 2009, they cost P120/kilo (but we managed to haggle down to P110/kilo). So cheap really considering they average P250 kilo in Manila. The ones we bought (3 huge ones that have a combined weight of 5 kilos) had bodies that were thick that we had to further divide them so the slices will be just perfect for barbecues. 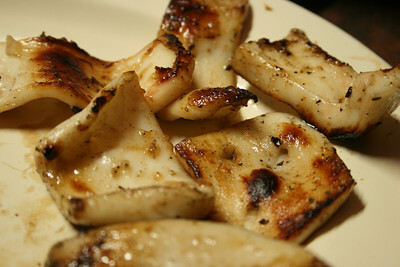 We just marinated them in butter, sugar and pepper.